Welcome to Node.js Course. This is first of many node.js tutorials. This post describes what node is, what node is not, practical application of node.js, why use node, who should learn node, what you should know before getting started, installing node and running your first node program. Moreover, we will also look into modules, how to install third-party modules in node.js, how to uninstall and update local and global modules. At the end of this post, you will end up making your own module in node.js whether you are using windows operating system, MAC or using GIT bash. If you haven’t used GIT bash, you may install it from here, although its not necessary but if you are used to UNIX syntax then you must download it. So lets dive in. scoring application (say for cricket scoring) where lots of people accessing change in score every split second. Front-end engineer, who is interested to apply front-end skills to server-side development. Simple: Core functionalities are kept to a minimum with minimum amount of complexity to the programmers. General concepts of how TCP and HTTP works. Familiarity with command line interface will be helpful. Windows:you will get node-v*.msi Windows installer. simple double click installer and click next next to install. Mac:you will get node-v*.pkg Macintosh installer. simple double click installer and click next next to install. Using version manager: Goto node version manager (nvm) icon-external-link and click install. By compiling source: Goto github hosted code icon-external-link and click install. yeah! That is your first successful attempt. Now lets do something more. 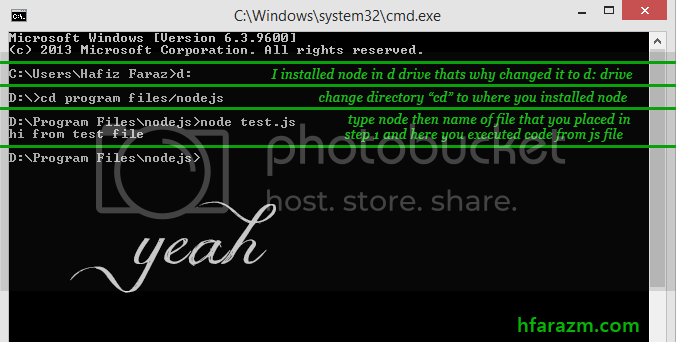 WINDOWS: Now lets see how to execute js file using node in windows specifically. First, open terminal in MAC or GIT BASH and navigate to directory where you installed node. In my case, I installed at D:/Program Files/nodejs. So I type in cd D:/Program Files/nodejs ( is escape character used when there is a space between name and then we write space to let terminal know about name with space, otherwise it will through error. Code Explanation: Line 1 says: get a file/folder of name “say” from the same directory where we have placed module.js. Once code grabs the “say.js”(will create this file in next step) file, place contents of say.js in “say” variable. Line 3 says: simply pass the string to say function(next we are creating it). Code Explanation: Line 1 says: This is a module which will export the function when required. Line 3 says: show message to the user. Okay, let me clarify more, module.js will grab the function from say.js file then module.js will pass the value to that grabbed function. Thats it you just created a module and loaded it using node. 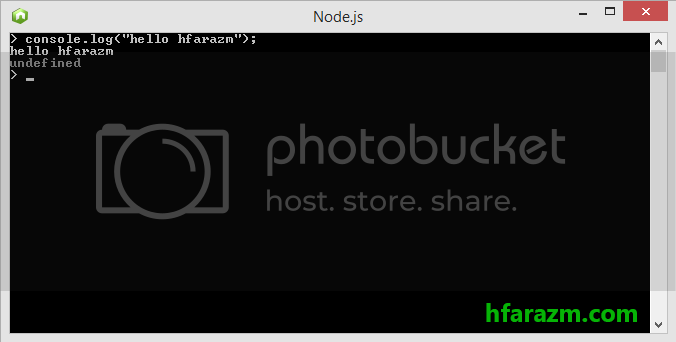 Well you just created your own module for node.js that shows you simple string message. What about third-party modules? Third-party modules are those which are available for you to use in your project. Thats great, its just like an add-on, with which you can enhance capabilities of your node application with ease. but how to use third party modules? we use NPM to use third party modules. 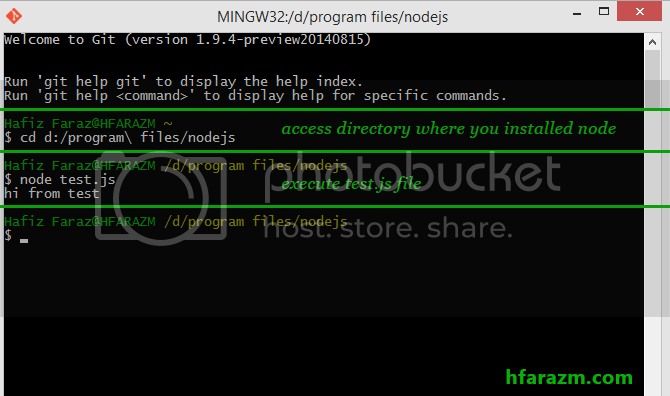 First, open command prompt and navigate to directory where you installed node. Code Explanation: sax is the name of module and -g represents a global installation. Code Explanation: sax is the name of module we want to install for now and -g represents its a global installation. Code Explanation: sax is the name of module and -g represents a global uninstall. Code Explanation: sax is the name of module and -g represents a global update. In the next tutorial we will do something more interesting. Hope you like this post. Please share. Thanks.